Whole Wheat Crepes | Component Cooking | Naturally. If I were to keep a list of items cooked most often in my kitchen, crepes would come in first. 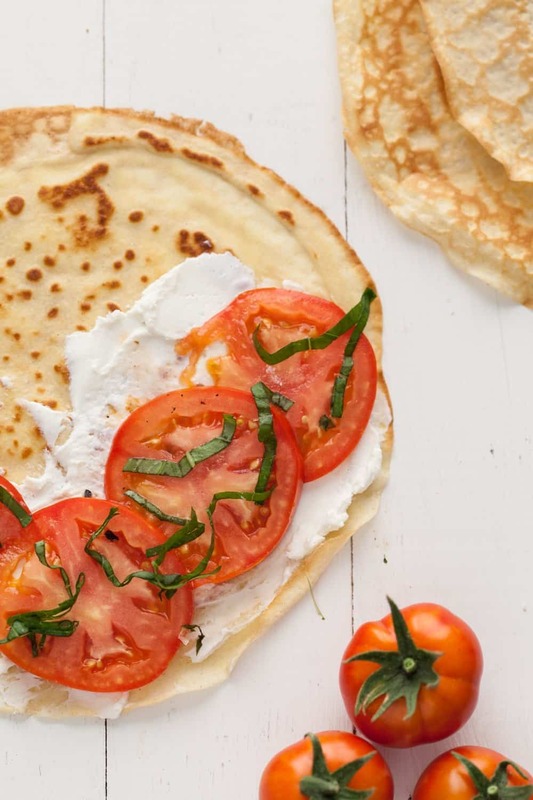 I love whole wheat crepes for breakfast in place of pancakes, wrapping ice cream for dessert, or using in place of bread for wraps, sandwiches or even enchiladas. Most recently, we’ve taken to smearing nut butter and a date-chia strawberry jam for toddler friendly roll-ups. The key to whole wheat crepes is the consistency of the batter and the heat of the pan. The batter should be thin enough that it easily covers the pan. The pan should be warm enough that as the batter hits the pan, it begins to cook. Get the master crepe recipe under your fingers and the possibilities are endless. An easy recipe for whole wheat crepes, perfect for a light breakfast, sandwich wrap, or even enchiladas. Whisk together flour, salt, eggs, milk, and melted butter until smooth. Alternatively, combine everything in a blender and puree until well combined. Heat 8″ skillet over medium-low heat and lightly grease with butter. Place a scant ¼ cup of batter in pan. Tilt/swirl the pan so that the batter covers the entire bottom of the pan in a thin layer. Tips & Tricks: I don’t always weight my flour. When this happens, I start with 1/2 cup of milk and add extra as needed because I tend to measure light. 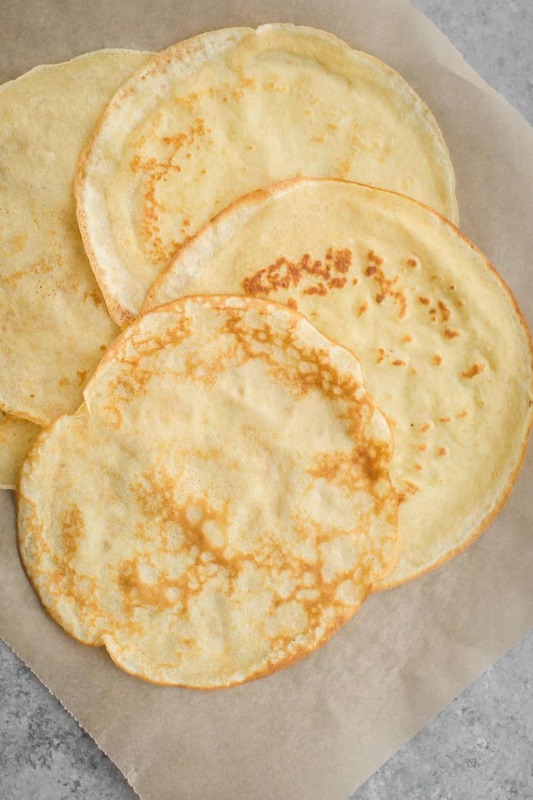 To freeze crepes, separate crepes with wax paper and place in an airtight container or freezer-safe bag. Store for a couple of months and thaw before using. If making sweet crepes, you can add a few teaspoons of your favorite sweetener. I like to remove 1 tablespoon of the milk and add 1 tablespoon maple syrup or honey. Alternative Flours: The nice part about using different types of wheat flour is that it’s a 1:1 substitute. Rye, Einkorn, spelt, and even barley flours make for wonderful crepes. 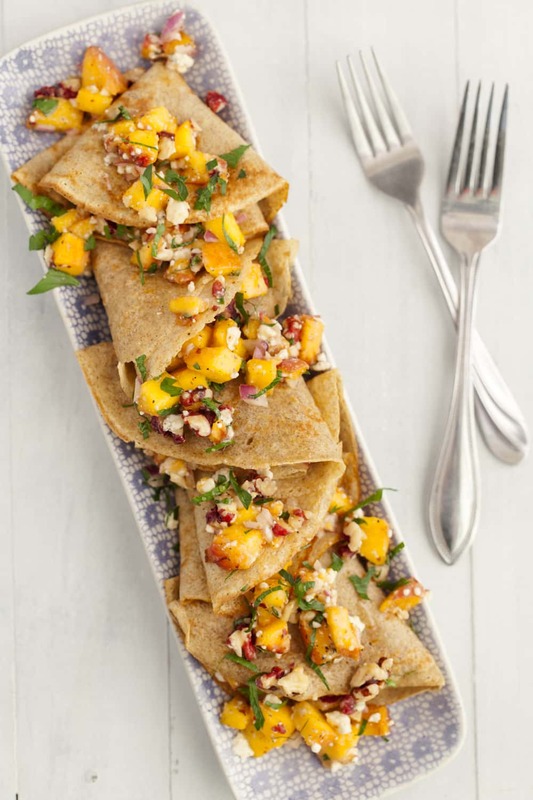 Gluten-free: Gluten-free crepes range from grains like oats, legume flours, and nut-flours. As long as the better consistency is similar to the traditional recipe, they usually work out just fine. 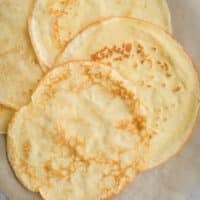 Grain-free: I’ve experimented with some grain-free crepes but a couple recipes you can check out include these coconut flour crepes or these almond flour crepes. 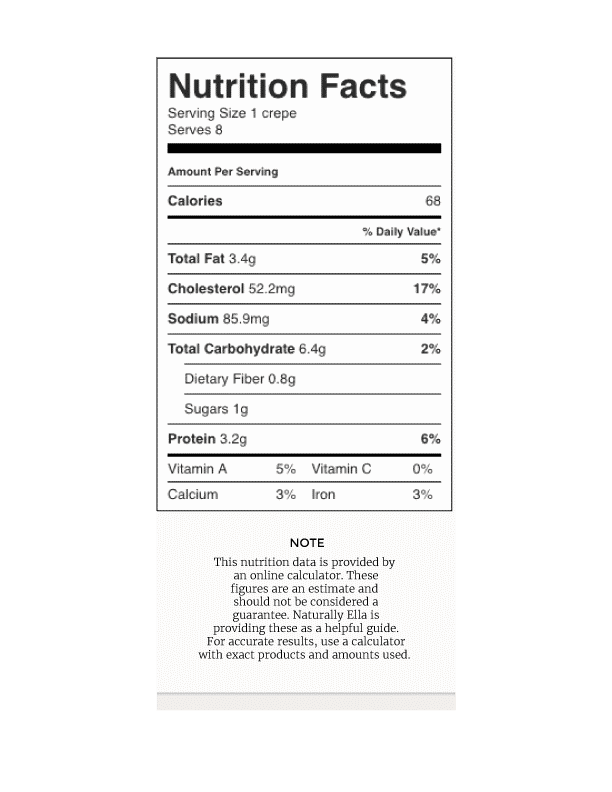 Vegan: Vegan crepes have even fewer ingredients than the traditional recipe. You can drop the butter for a vegan substitute or oil, almond or soy milk, and skip the egg to increase the almond milk by 1/4 to 1/3 cup. The best thing about crepes is that you can really stuff anything into a crepe and have it be delicious. The lightness of the crepe means it’s great for dinners through desserts. 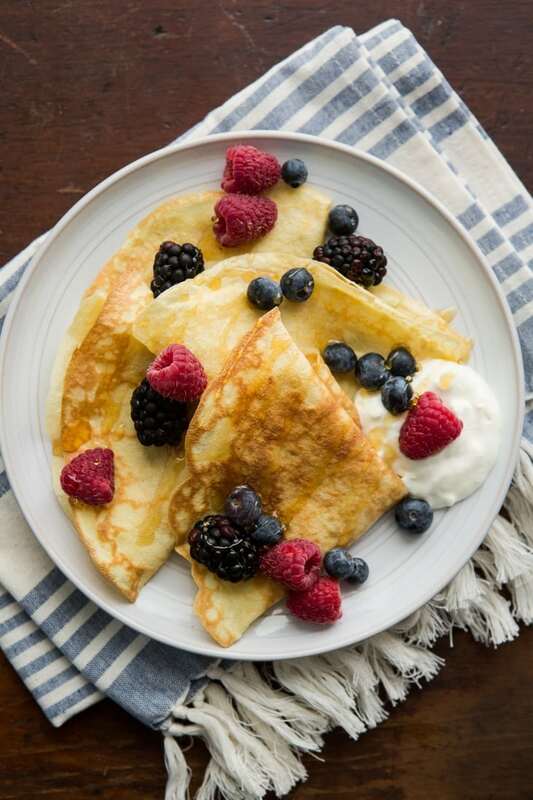 Breakfast (sweet): Top with fresh berries, sautéed fruit, or curd for a pancake-like breakfast. Drizzle with a bit of melted butter, maple syrup, and toasted nuts/seeds. 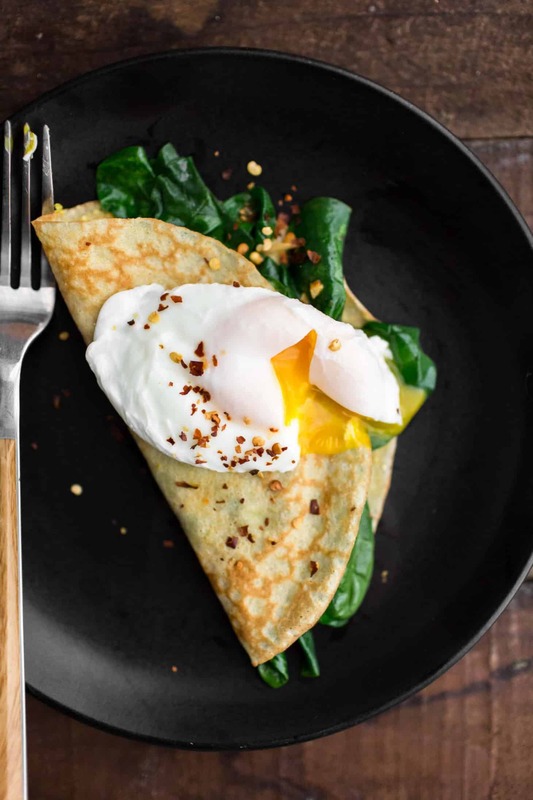 Breakfast (savory): stuff the crepes with roasted or steamed vegetables and top with a fried/poached egg. Dessert: Wrap a scoop of ice cream or custard in a crepe and serve with a drizzle of chocolate sauce, caramel, or berry sauce. Grilled Cheese: Add cheese, greens, and/or vegetables to the crepes and grill again to melt the cheese. Really any type of traditional grilled cheese can be turned into a grilled cheese crepe. Sandwich Roll-ups: Hummus, greens, cheese, nut butters, and jellies all make for easy sandwich roll-ups. Manicotti: Stuff with ricotta filling and top with a good marinara and cheese. Bake like you would lasagna. Vegetables/Herbs: Stuff with any type of vegetable: roasted, grilled, steam, braised, or fried! I’ve really never met a vegetable that didn’t work stuffed in a crepe! You can also add fresh minced herbs to the crepe batter. Enchiladas: I like to use cornmeal or masa crepes in place of the corn tortillas in my enchilada recipes. So simple and so yummy! Really good with cucumbers and some ricotta cheese! what a wonderful idea! I’ve always just eaten these, never made them, whole wheat flour, even better, plus love all of the serving tips for sweet, savory (I like flour tortillas but they can get a little rubber-y), thank you very much! I just made these!! Perfect proportions! This is my new go to recipe – so delicious and easy! I highly recommend weighing the flour to get consistent results. On my second time making these, I didn’t bother adding honey to sweeten the crepes and didn’t miss it. Also, this recipe only yields 5.5 crepes for me. Thanks for the recipe!